This autumn we wanted to explore the French Centre and South West regions as we have often passed through. We left home on 27th August and spent the night at the Caravan Club site at Abbey Wood so we could meet up with our son and family. We invited them over to our camper where we had a BBQ. It is always great to see our Grand daughter, Greta. The following day, after a lazy start we headed off to Dover and crossed over the channel in the evening, spending the night at the P&O/SeaFrance carpark. 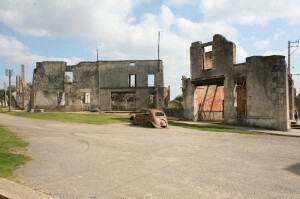 After breakfast the following morning we set off south and aimed to reach Chartres just north of Orleans. 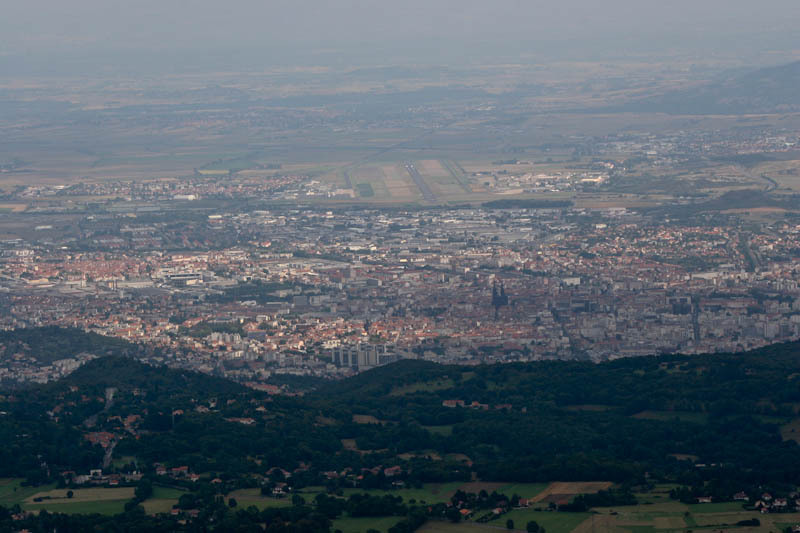 We wanted to reach Chartres in time to be able to look around the city before it got dark. We pulled into the Municipal site, Les Bords de L’Eure on the outskirts of Chartres. 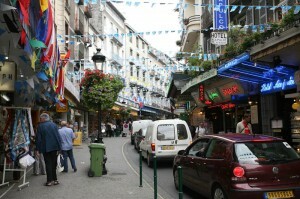 After an early dinner we set off to walk into the city centre. The cathedral stands well and there are numerous other very old buildings worthy of a browse around. The following morning we set off with the objective of reaching the volcanic region around Clermont Ferrand. We chose to stay at the Lac d’Aydat, a volcanic lake as the French guide book recommended it. The site itself was fine with an elaborate entry system that caused a worry. You drive forward over the first bollard, which then raises out of the ground once you have reached the second and then the second bollard lowers to allow you in. The worry was would it cope with an 8.5 mtr camper – answer – only just. We spent part of the next day walking around the lake but were not impressed as part was on paths and part was climbing over rocks right on the lake edge with a serious chance of getting your feet wet. In the afternoon we moved over to the base of Le Puy de Dome. The car parking attendant was extremely helpful and guided us over to the reserved area for camping cars. 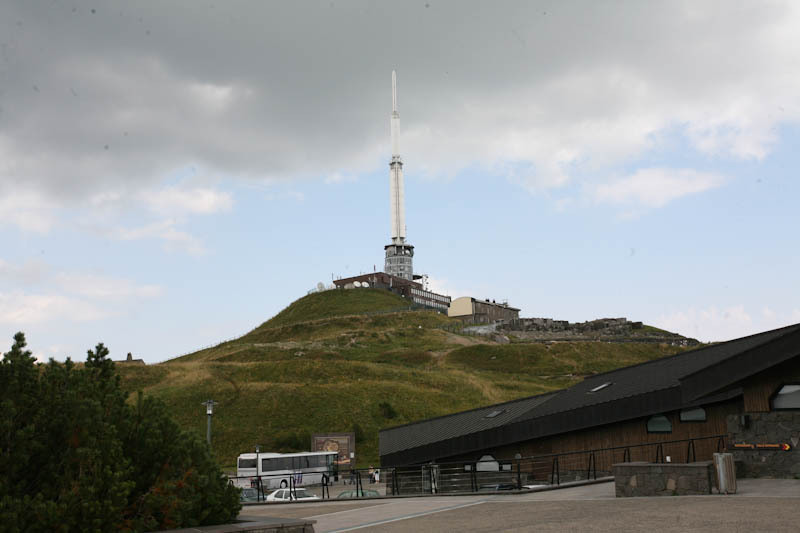 There are a couple of ways to get to the top of the mountain – walk or catch the shuttle bus. We caught the shuttle and decided to walk down. At the top there is quite a few places to see. First and foremost the views are spectacular. 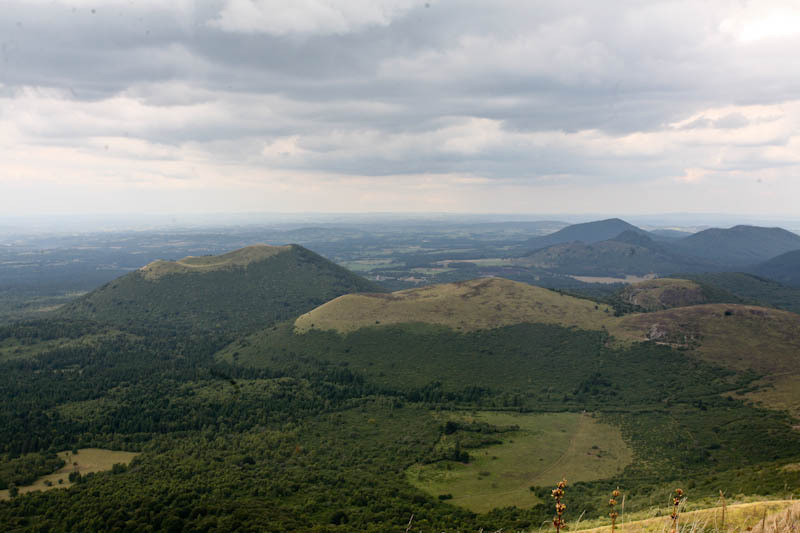 Le Puy de Dome is the oldest and highest extinct volcano in the Mont Dome chain of 112 volcanoes. From the summit the panoramic landscape is incredible. 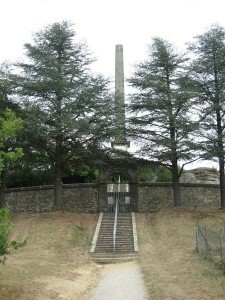 A short walk on the summit is the ancient temple of Mercury, built by the Romans. There is also a visitor centre with lots of information about the area as a whole. 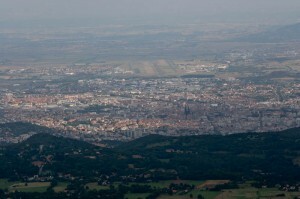 There is a walk around the summit that gives you a marvelous view of Clermont Ferrand and the airport beyond. Just as we started to walk back down the mountain the heavens opened and we had rain, hailstones and gale force winds – so we back tracked and caught the shuttle. The rain and wind turned into a very lively thunderstorm that raged on for several hours turning the carpark into a raging torrent, so much so that several camper van owners moved away during the night leaving just a few of us remaining. 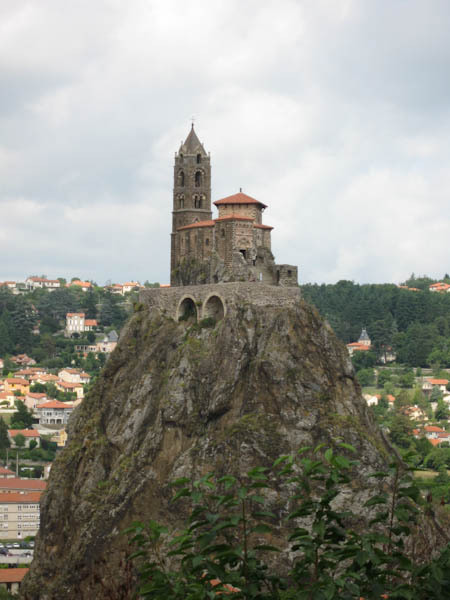 The following morning the cloud base was too low to warrant another trip up to the summit so we decided to move on to the Tarn Gorge area but first visiting Le Puy en Velay. The cathedral dominates the skyline well before you reach the town and the surroundings are very impressive. 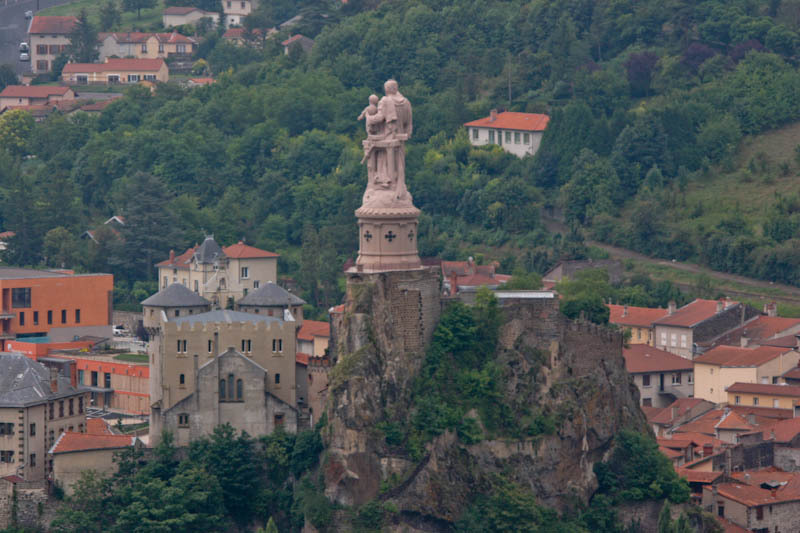 The Roche Corneille is the home of the statue of Notre Dame de France and St Michaels Chapel stands on a huge needle of lava accessed by a winding staircase and bridge. The old town has several lace shops with lace makers working outside in the streets. 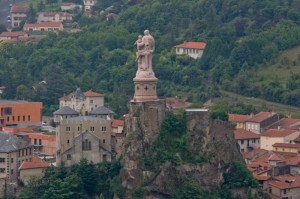 Le Puy en Velay was well worth the visit. 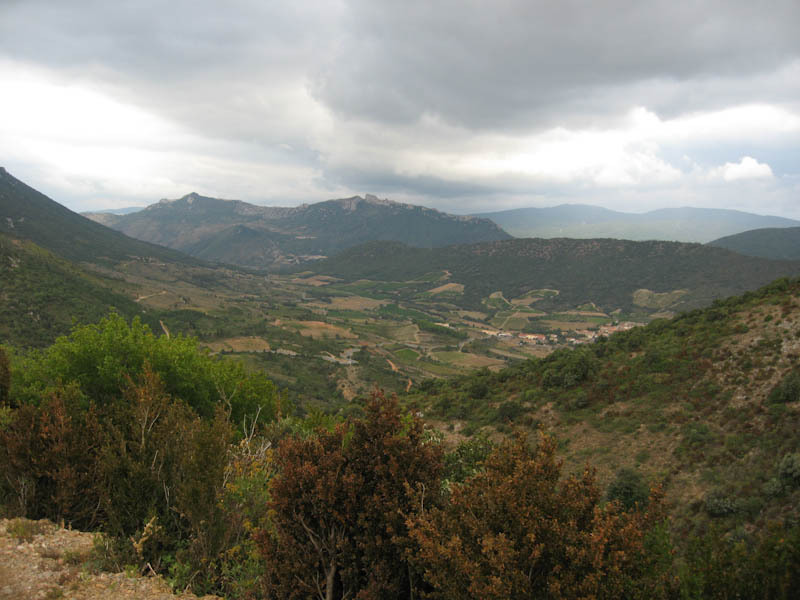 Next we made our way to Florac – the beginning of the Tarn Gorge. 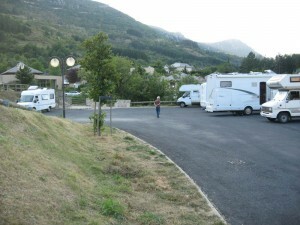 We stayed at the Aire in Florac with good views of the surrounding mountains and a pleasant small village, however the Tarn Gorge wasn’t accessible by cycle track so the following day we set off in the camper to see how far we could get. Answer – not very far. The road was too narrow for our taste, twice having to back up to allow oncoming traffic to pass and the final straw came when after a few miles we encountered a low bridge – like 3.2mtrs and we need a minimum of 3.5mtrs so we had to make a U turn and return back to Florac. We then headed for the A75 Autoroute and headed off down to Millau where we stayed on the Aire near the river. Its a lovely Aire in a nice location some 200mtrs from the town centre. The only downside for us at least was that the pitches are marked off by telegraph poles making it difficult for large vehicles with no room for error. That said its a good spot. The river is to the south of the Aire and walking along you can get a fabulous view of the new Millau Bridge – particularly good early in the morning or at dusk when good atmospherics can be seen. Millau town is a thriving, teeming place with lots of activity, even in winter. There is a good wine cellar some 300 mtrs away that allows you to bring your own bottles to fill up with wine at a cheaper price. 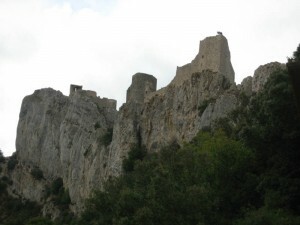 Millau is at the confluence of the Tarn and Dourbie rivers so would be a good base to explore either or both gorges. The following morning we decided to walk along the Tarn river and see how far we would have to go before the exciting stuff started but we ran out of path after about a mile or so and got fed up of walking on the main road with no footpath – well at least Chase did. Back we went and explored more of the town centre and had coffee in the enormous square. 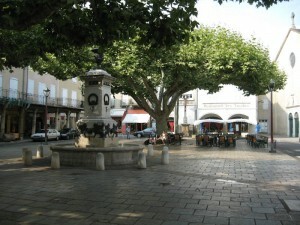 The next day we set off for the Camargue – all new to us. We headed towards Port St Louis but carried on instead of crossing the Rhone and carried don down the narrow road that straddled the salt pans of the Camargue until we reached Pie Manson Plage. 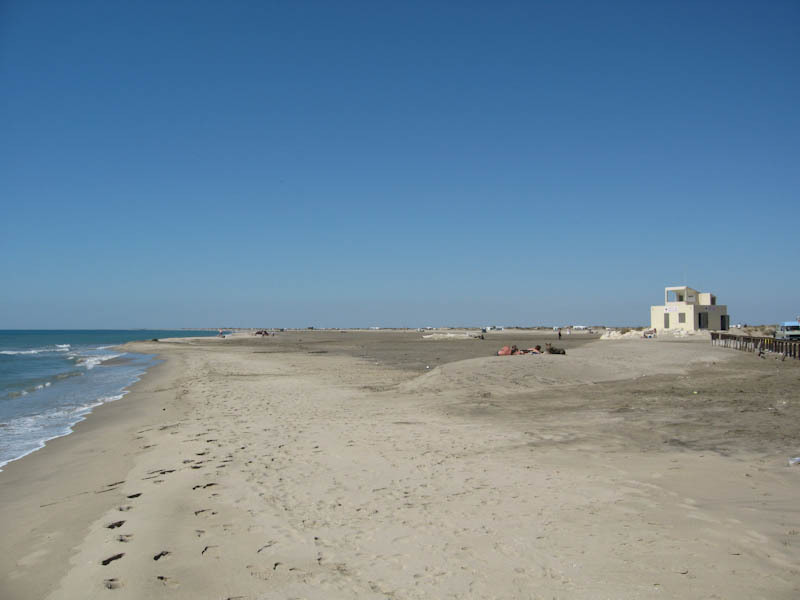 This is a vast beach area where the sand on the landward side is hard packed and then a few feet from the waters edge bocomes normal beach. There were some 100+ campers parked there but as they were all spread out along the beach it appeared empty and our nearest neighbour was some 100 mtrs away. Chase thought this was great as he could run around free to his hearts content. There are no facilities here so you do need to make sure you have full fresh water, empty waste and empty WC cassette. Chilling out, beach combing and BBQ’s are the norm here and apart from a dry thunderstorm the first night we really enjoyed it here and will certainly return again. 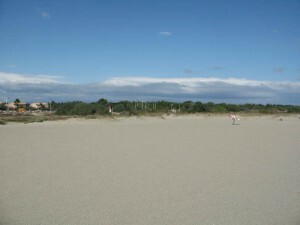 We moved on from here along the Camargue towards Saintes Maries sur Mer as the wind was getting up and blowing the sand. Along the way there are numerous local stalls selling fresh fruit, veg and local wine we bought fresh figs and melons- prices vary. At Sts Maries there are several choices of places to park – two Aires and two camp sites – all around the same price – its all a matter of where you want to be. We used the Aire at the eastern end by the sea wall. 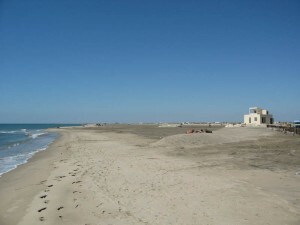 The town of Sts Maries is very busy in summer and can be dead in winter as its main industry is tourist related with plenty of riding schools, Bull fights, local produce and of course restaurants, bars etc. There is a nature reserve surrounding the town where Flamingoes, wild horses, are in abundance. 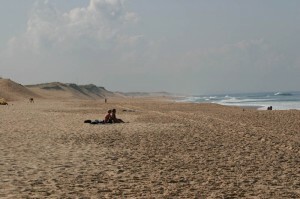 There is a nice path along the edge of the beach that can take you over 20kms east and among the wildlife and sand dunes. 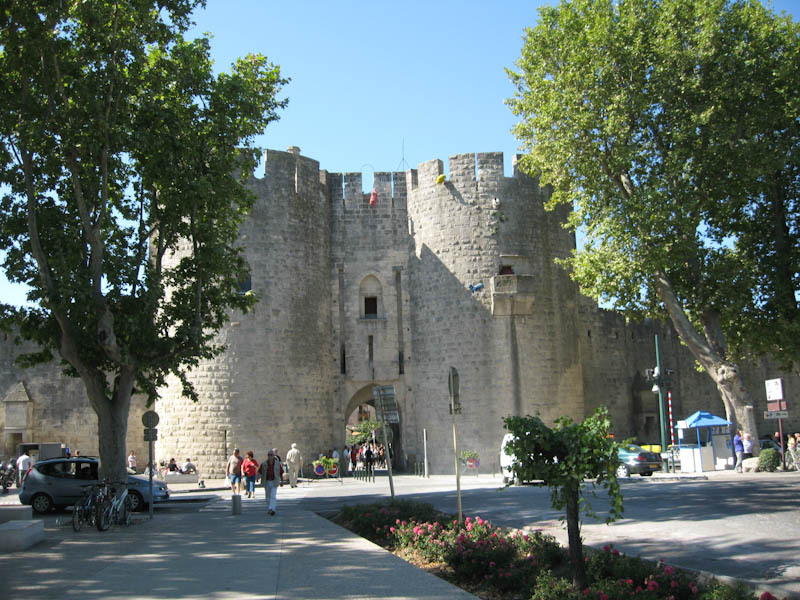 From here went to Aigues Mortes a walled town that used to be a port. There are towers around the wall with the main tower called Constance Tower. There are boat trips around the various lakes, Sunday market and a large traffic free square with lots of cafe’s and restaurants. 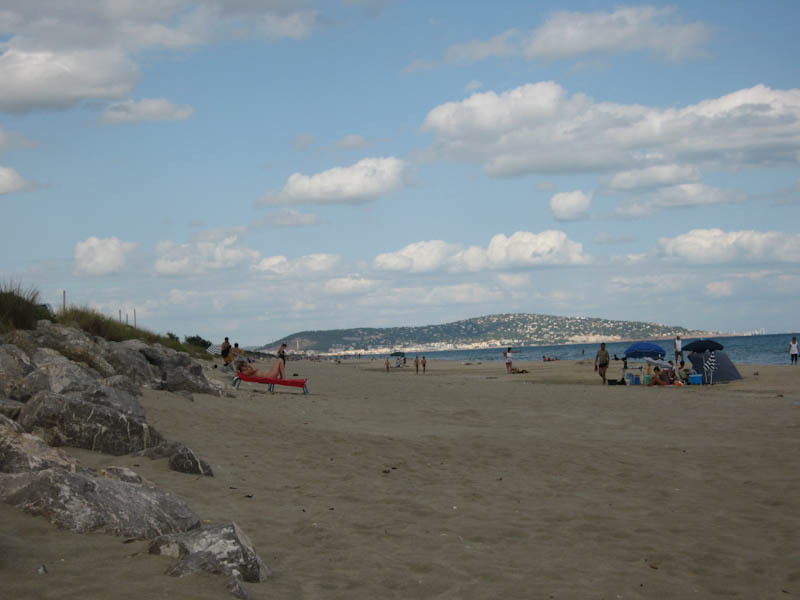 From here we moved on to Sete Beach, a long strip of wonderful beach where the main road runs right alongside with places for vehicles to park. All year round campers park in these places and stay sometimes for weeks on end. Its not everyone’s cup of tea as there is considerable noise and buffeting from the road when trucks pass by. 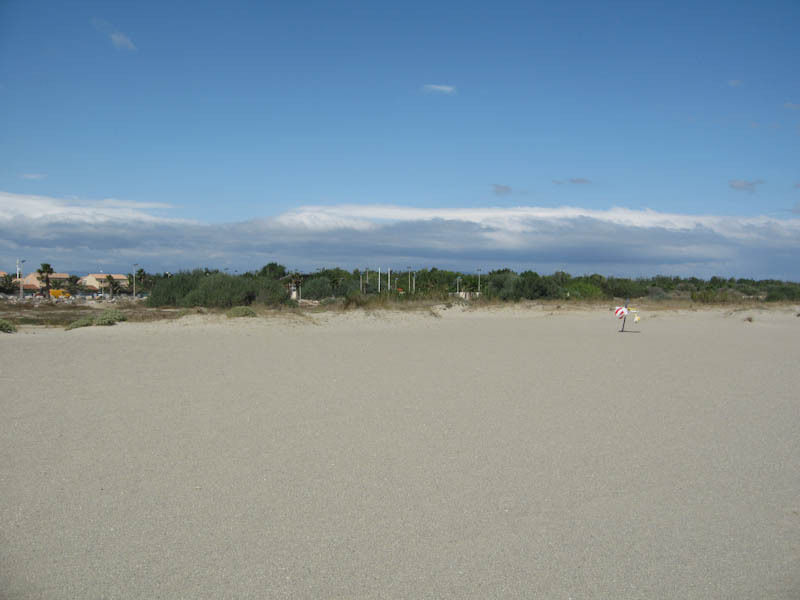 We only stayed a few hours as Chase loved running wild on the beach – not that many places so dog friendly and we then moved on to Trebes, a lovely Aire on the side of the Canal du Midi. This is a super Aire with miles and miles of cycle tracks along the canal and great fun watching the hire boats on the canal when they try to navigate into the numerous locks that are dotted along the way. One good trip is to cycle into Carcassonne, aprox 12kms away, to look around the sights of the city. 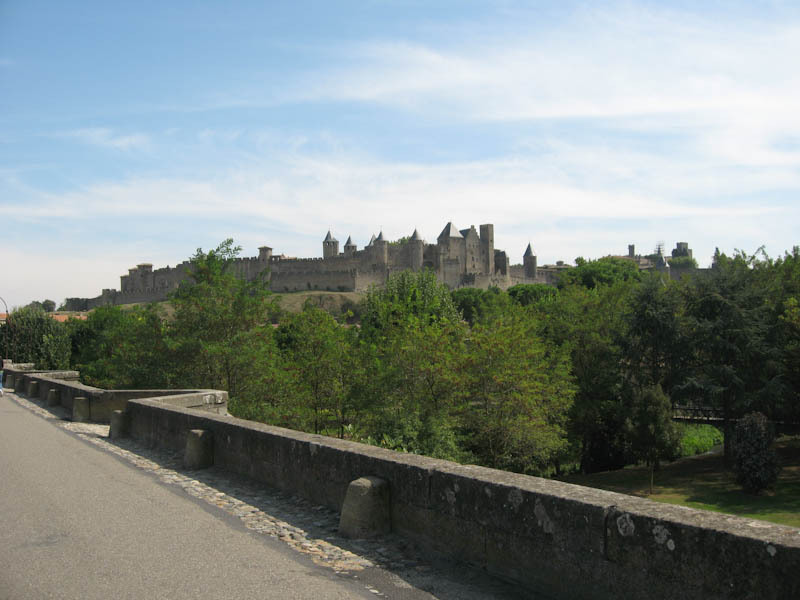 The old city of Carcassonne is a whole new ball game and deserves a dedicated trip. We also tried cycling in the opposite direction and again a very pleasant trip down the canal. At the end of the Aire there is a shop selling all manner of locally produced jams and preserves using interesting ingredients. We stayed here for four days as the weather was good, the activity on the canal and in the village was good, the wine was good and the local restaurants were good. 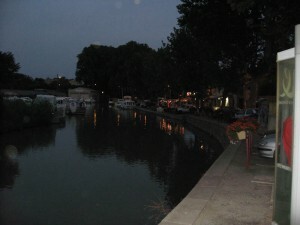 We then decided to move a little further up the Canal du Midi to Montferrand. The Aire is also by the canal but can be recognised by the large stone needle/obelisk that stands out some 100 mtrs off the main road with a path to it from the Aire itself. There is a Tourist Information Office in the Aire that also doubles up as a small cafe in summer. Was open only weekends in October. 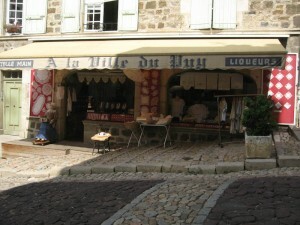 We walked a couple to kms into the viallge of Montferrand to buy bread and bits only to find the shop had a van that visited the Aire each day. Off again this time to Quillan a small town seemingly in the middle of nowhere. The Aire is actually the old railway station carpark/foyer with a direct access into the town centre. Beautiful scenery around and a very bustling town, especially on Saturday – market day. There is a small Chateau however it a ruin. From here we continued to Peyrepertuse – a very small village surrounded by mountains with a Chateau built on top of one of them. The Aire is very quiet, has several water taps and a toilet with wash basin. The real attraction here is the Chateau some 4kms away – up hill. There is a bus service or you can walk – we walked as Chase wanted a leg stretch. As I say its uphill all the way and the Chateau is built into the sides and top of one of the mountain ridges – very impressive. In 2008 the entrance fee was €5. The walk down was much easier. There is another Chateua in the area – Queribus – not as impressive but still on top of a hill. It was much easier to park at the crossroads and walk up to the entrance. 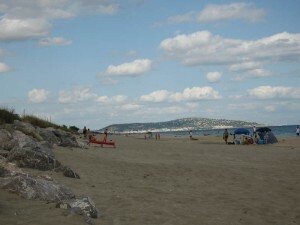 After this we drove to Canet Plage, which is at Sainte Marie on the coast. This is a real holiday resort and is completely closed down during the out of season period – that’s anytime from mid September until June. 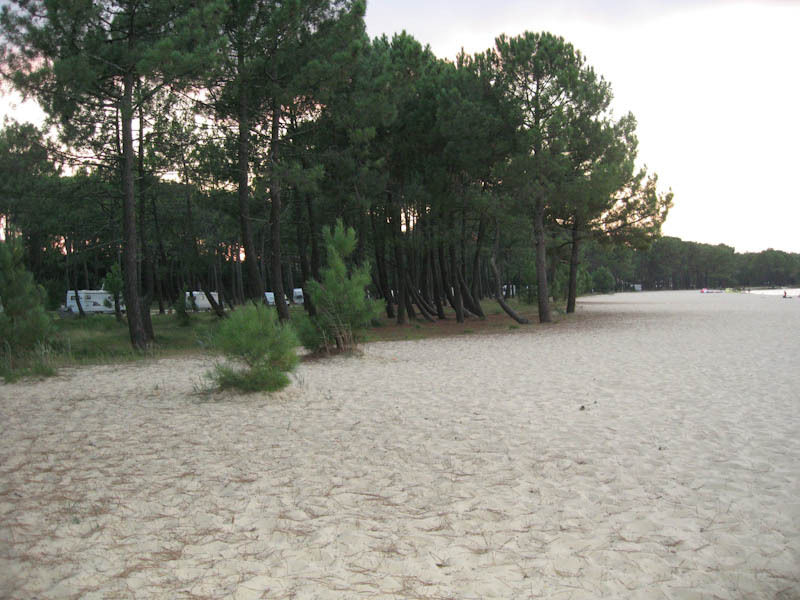 We stayed at the Canet Plage campsite – a very tight place for large campers and took the opportunity to do the laundry and even the site was in its final week before closing for the season. Unfortunatley the wind was starting to get up and had been increasing steadily for the past couple of days so off we went again. We had come round in a circle over the past week so now it was time to get back on track and continue with our “planned route”. We had enjoyed ourselves so much at Trebes that we decided to spend another couple of days there before moving off over to the west coast. On arrival at Trebes we saddled up and cycled into Carcassonne, this time to have a short exploration of the old Cite to make sure it was worth coming back for a proper look. We were not disappointed and Carcassonne cite is definately worth coming back for. We both thought it reminded us of Mont St Michel in Normandy. Cassoulet, the local bean stew is an aquired taste and I guess I didn’t get a good version so next time I will try a different place. So we deided to get a few miles under our belt and catch up on our plans so we made it to Mazeres sur Sarlat a village en-route to Lourdes. We had lunch in the Aire and liked the position – by the side of the river with nice views – the village was rather dull with few places to visit so we moved on after lunch and finally stopped at Camping du Ruisseau a pleasant site within walking distance of Lourdes centre. 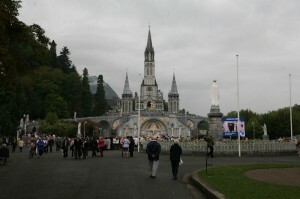 We walked into Lourdes the next day with the thought of visiting the Tourist Info office to get an idea of what there was to see – totally unnecessary as it was very obvious what to see and where to go – just follow the crowds. We were very disappointed with Lourdes – for us it was very commercial, very busy with 100’s of souvenir shops all selling the same religious mementos. The whole town was littered with professional beggars on every corner. Bus loads of people all with guides and around 50 or 60 people following them around. There was a continous stream of people in wheelchairs going to the daily service for sick all looking for a miracle cure from the holy water. 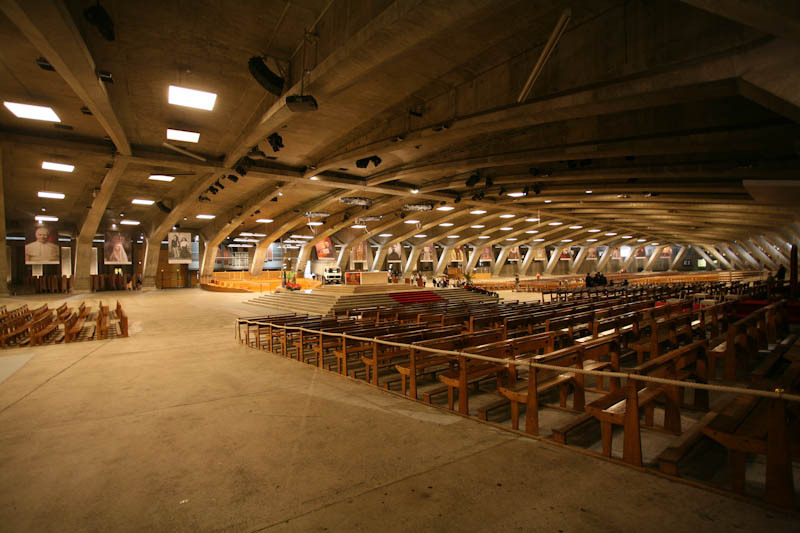 We visited the Pilgrim Centre, went into the Basilique du Rosaire, all packed with people queuing to receive wafer in the Basilique Sousterraine which holds 20,000 people. We took the tourist train round the old town driving past the birth place of Bernadette and her life, her school and cachot where she lived in times of visions of the Virgin Mary, the church where she was baptised. It was disappointing to see people gate crash and totally ignore a funeral that was taking place just to dip their fingers in the font where Bernadette was baptised. We bought lunch and decided to find a quiet spot where Chase could have a romp (dogs were frowned upon everywhere in Lourdes) and found a small park off the beaten track that was littered with all the beggars drinking beer and eating better than we were and a miracle had happened – many of the beggars had been cured of their ailments – just for the lunch period though and no doubt they would assume their ailments after lunch. 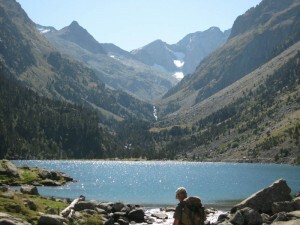 The folowing day we headed up the valley into the town of Cauterets at the foot of the Pyrenees. This is a summer and winter resort with a spa. It was a pleasant and bustling town surrounded by mountains. 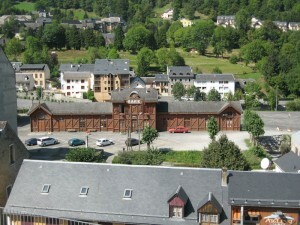 The old railway station is the largest wooden building in France, built in 1889. The following day we took the forest walk up to Pont d’Espagne along chemin des cascade. Its quite a steep track but very pleasant. You can of course catch the bus to the bottom of the chair lift. Catch the chairlift and then take the short walk to the Lac de Gaube in the Pyrenees National Park. There are very strict regulations for dogs and they must be on a lead all the time. Dogs were not allowed to walk on the path round the lake. Also you are not allowed to walk down if you have a dog – the dog must come down by chairlift. There are only two paths that dogs were allowed and both leading to a restaurant. We came back by road as Chase was allowed on the road and the hairpin bends made interesting scenery. We arrived back tired but happy. The following day we took the paths that circumnavigated the town and walked up to Railliere and took a different route back. 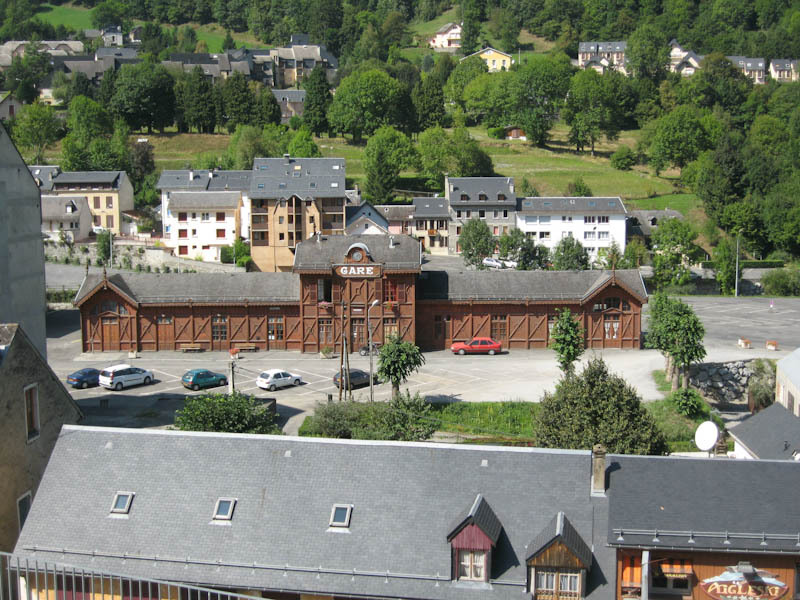 There are lots of hiking and walking paths around Cauterets and there is a National Park visitors centre near the railway station with lots of information. The local indoor market is worth a visit and we tried out one of their local ready cooked dishes of fish and seafood mixed in a sauce – very nice. 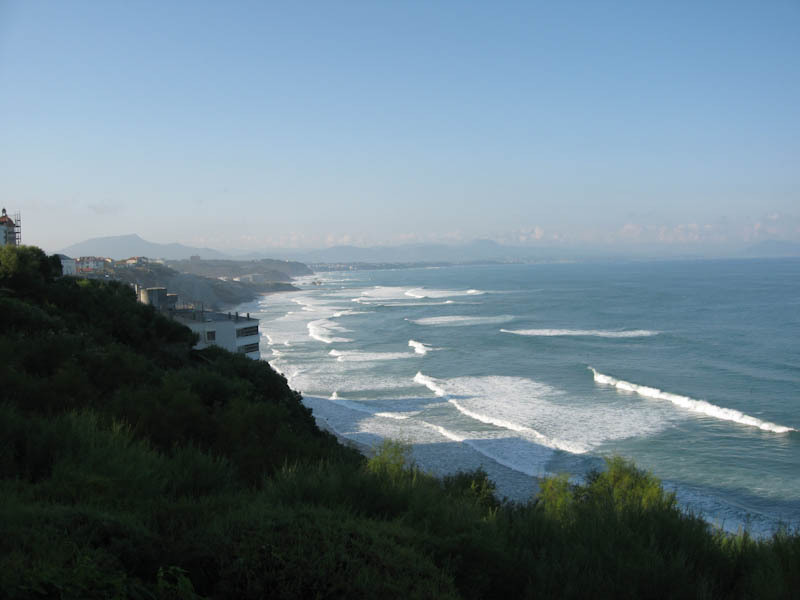 We now decided to move away from the area and visit Biarritz – you can do this in a camper – just please yourself. 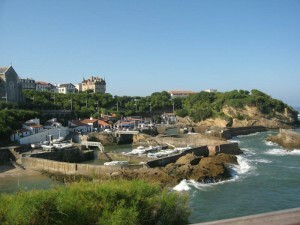 We parked in the Aire at Biarritz by Milady Plage south of the main beaches, which was very full for that time of year. This allowed us to give Chase a good run on the beach. There is a cafe/restaurant on the beach that was always full so must have been good quality and value for money. 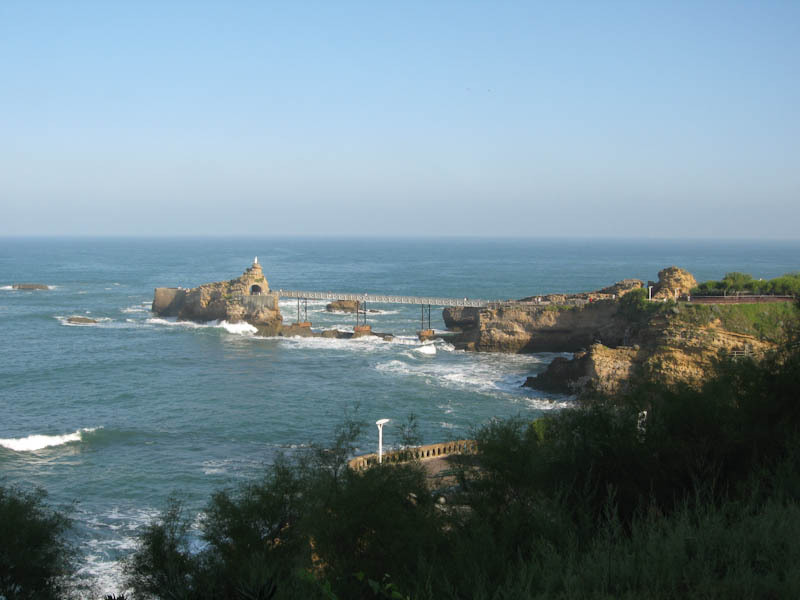 Biarritz centre is a 3 km walk along the cliff top and road (parts of the cliff walk were fenced off) and has lots of attractions and super inlets to see. 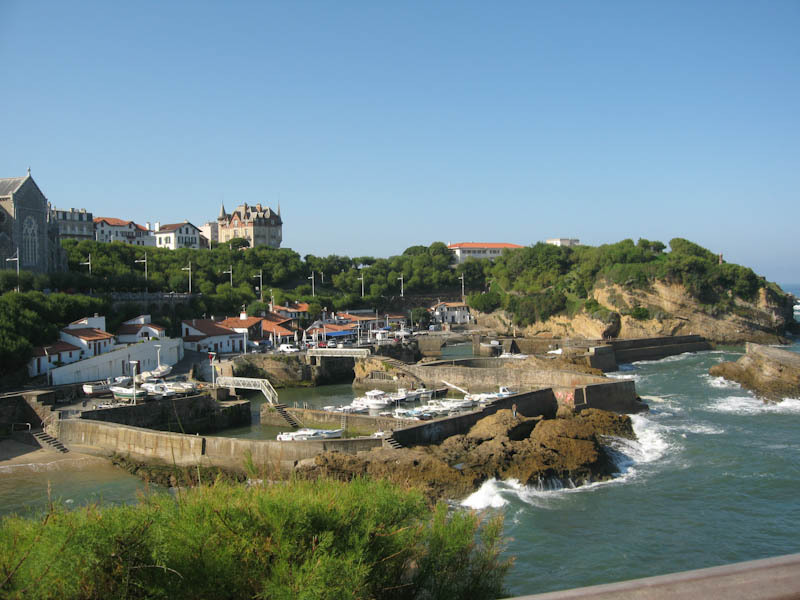 Biarritz used to be a small whale fishing harbour and when it became popular there sprung up lots a beautiful large villas giving Biarritz its status today. There are always surfers on the Cote des Basques plage and swimmers in the Port vieux plage. 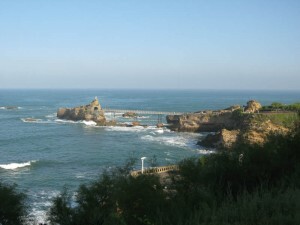 There is a footbridge across to Rocher de la Vierge and a path down to the Port des Pecheurs with its tiny marina. Be bought lunch and sat on the seats at the viewpoint at Rocher du Basta then had coffee in the cafe on the beach overlooking the coast. Whereever you look the views are stunning and all different with mountains of the pyrenees, beuatiful sunsets and the lights of Biarritz at night. Well worth a visit. 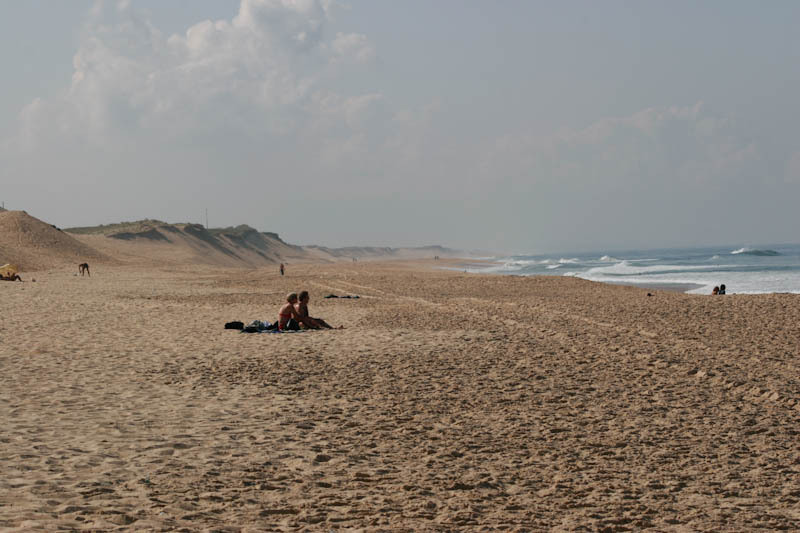 We now headed up the coast to Capbretton on the dunes – a surfers paradise with long sandy beaches and Atlantic rollers that stretch for miles. Capbretton is a centre for the world championship surfing and when we were there there were several TV camera crews making documenteries for tv companies. 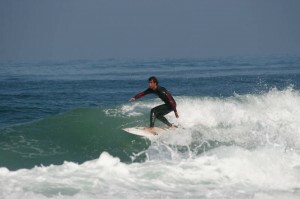 This activity has brought several cafe’s, restaurants and the obligatory surf shops. 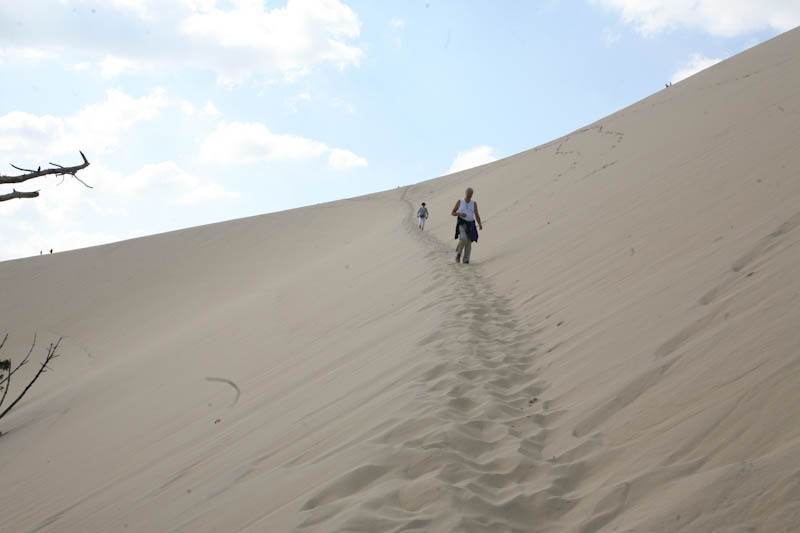 Near to here is the largest sand dune in Europe – Dune du Pyla so we just had to visit and climb to the top all 170 steps. You have to “run the gauntlet! though to get there, meaning the dozens of shops/stalls on either side of the road to the dune. 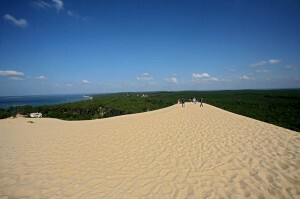 From the summit there is a nice walk across the top with views over the Arcachon bay and out into the Atlantic. The Aire there is tucked among the trees at the end of the carpark and as we had climbed the dune there seemed no necessity to stay the night so off we moved to Navarrosse, to stay at the “wild camping spot” by the side of the etang and some 1km from the official Aire. The beach is good for a lake and there is obviously lots of water sports during season and a marina with a campsite/village surrounding it. there was even a supermarket. We walked along the beach and around the marina. BBQ’d and spent a relaxing evening there. We had one more stop before leaving the area and that was to visit the oyster beds at Andernos-les-Bains on the Arcachon lagoon. This is a major oyster producing region of France and is said to be where all the baby oysters are reared before despatching to other regions. I sampled 18 of them just to test for quality you understand and paid the princely sum of €3.50 – by far the cheapest oysters I have ever purchased. Andernos is a nice town with a harbour lined with oyster restaurants all offering local seafood and oysters of course. 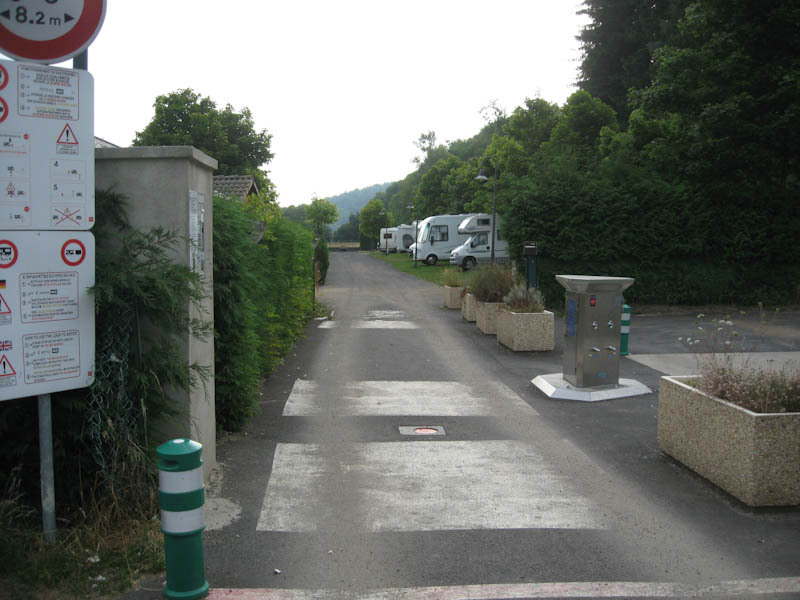 There are cycle tracks through the woods to the north to the resort area of Ares – a town/village it seems consisting entirely of holiday villas and holiday centres. 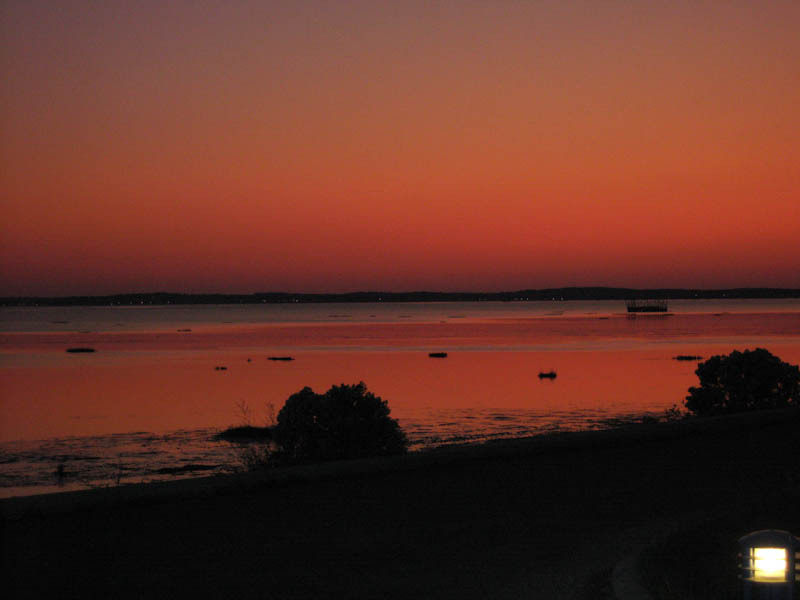 We sat on the harbour wall and experienced a most magnificant sunset. 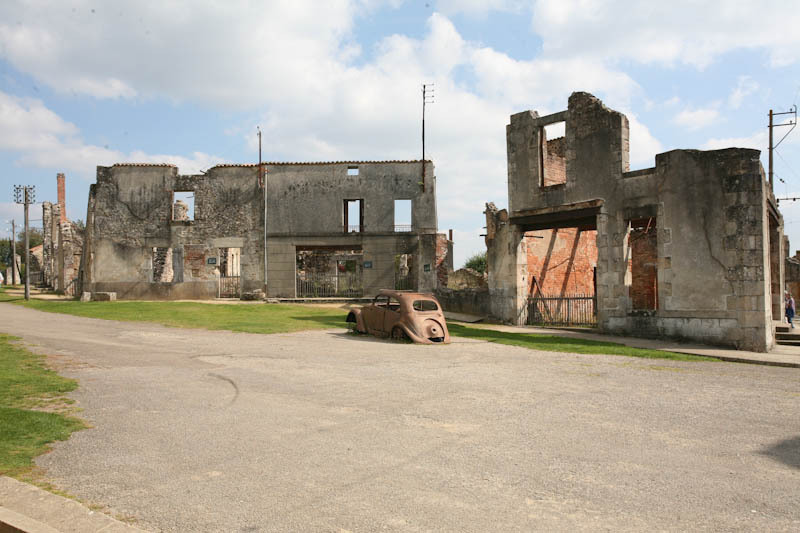 Well having achieved our objective we set off inland towards Oradour-sur-Glaine, first stopping at Angouleme, parking by the river and walking up the longish road up to the old town. We walked on the ramparts taking in the views all around then a visit to the beautiful cathedral down the narrow streets with their fine old buildings before heading off to find a stop for the night. The stop happened to be Roullet St Estephe, a quiet village in the heart of agricultural France. The Aire was a large carpark with a small lake at the end with a path all around. Very nice for a stopover. 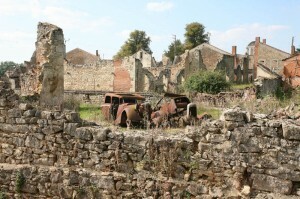 Our next goal was to explore Oradour-Sur-Glaine – a village 20kms west of Limoges with a terrible history. During 1944 on the 10th June for reasons unknown the German Army decided to surround the village and slaughter over 600 people inside. 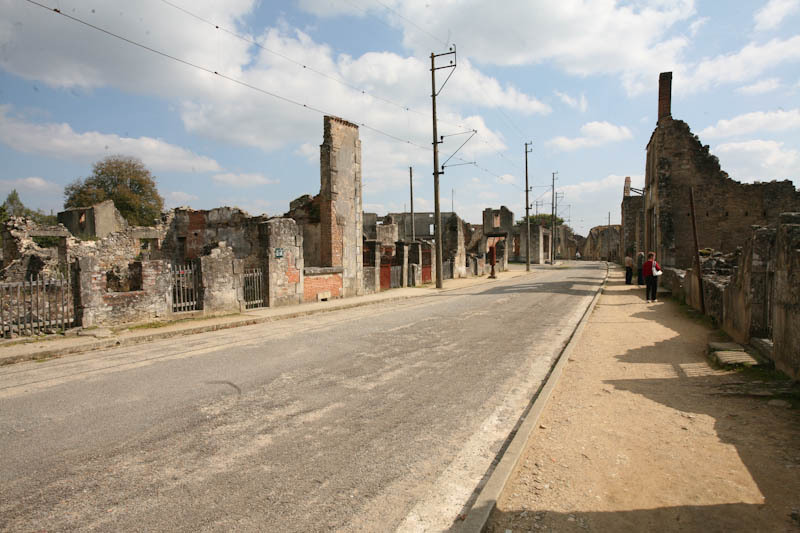 As a mark of respect President De Gaule declared the village a war memorial and everything was left as it was with cars, furniture etc. just left out on the streets. 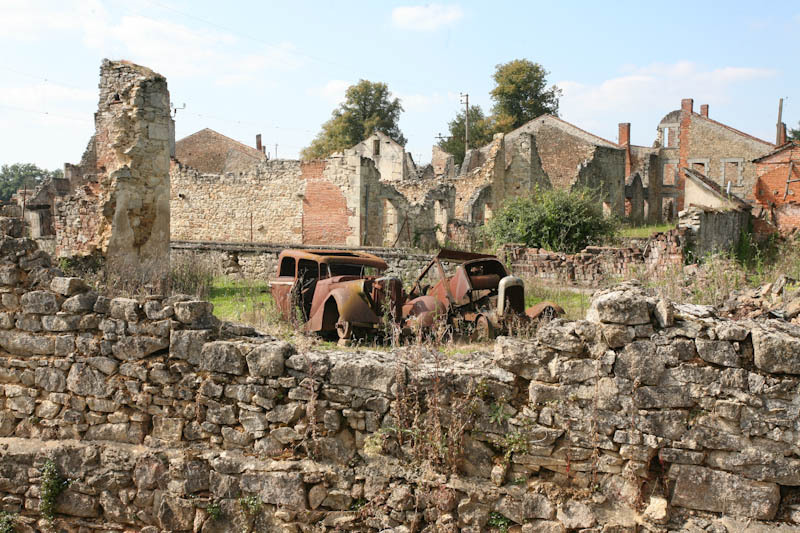 The new town or Oradour is located a few hundred metres to the west of the old town with the Aire just to the west of that. The Aire itself is a very pretty, well set out aire with individual hard standing spaces, seperated by shrubs and curb stones all terraced – one of the best places we have visited so far on our travels. From here we headed north as we still had one objective to complete. We headed towards Orleans and decided to stop half way at the Aire at Selles-sur-Cher – a pleasant place outside the gates of the municipal campsite, now closed for the year. 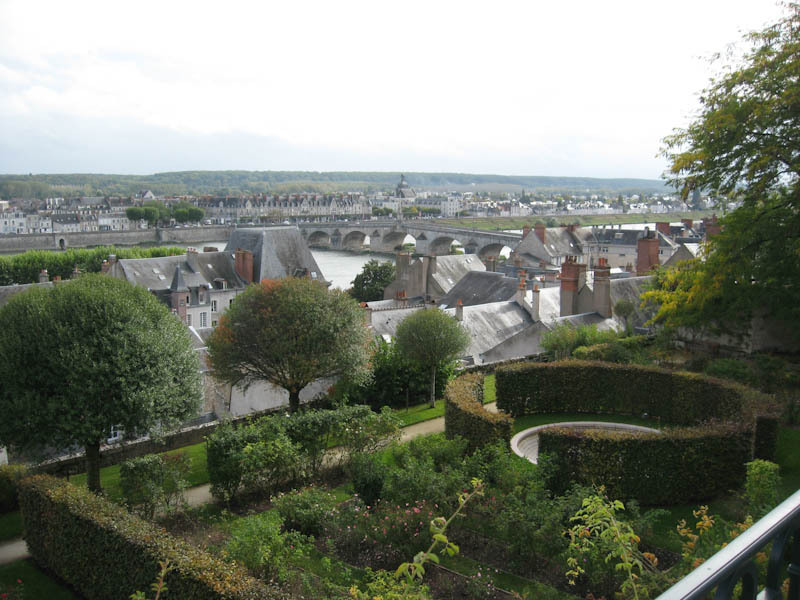 After a good nights rest we headed up to Beaugency – another great Aire on the banks of the Loire. The town is very pretty and there are several walks on the banks of the river. We stayed a couple of nights here exploring the area and the Aire is well worth the visit and we would have stayed longer had it not turned frosty in the morning – alas winter approaches. 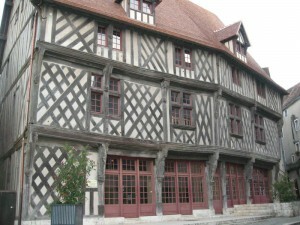 We moved on to Blois for a night as we had visited here many years earlier. The Aire is on the river side of the wall and is accessed down a steep ramp with open views across the Loire. 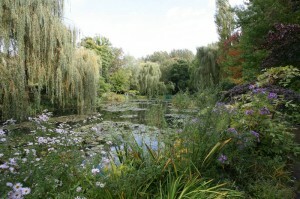 We wanted to get to Giverney before Monet’s house and gardens closed for the winter. 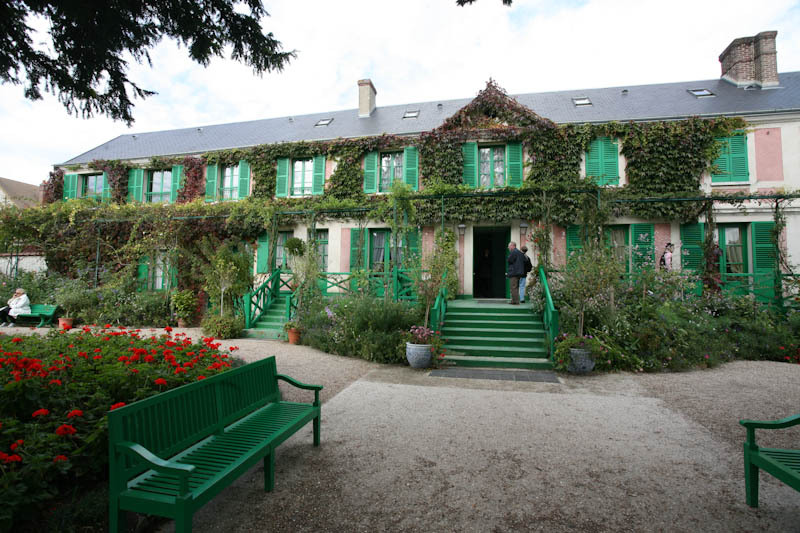 We arrived and parked in the massive carpark – clearly Monet gets lots of visitors… We went round the house that was filled with lots of prints of Monet’s paintings. The garden was colourful, predominently yellow but no water lilleys in bloom. The garden is quite large and well worth a walk around with streams, bridges and lakes all designed by Monet – clearly not a poor artist. 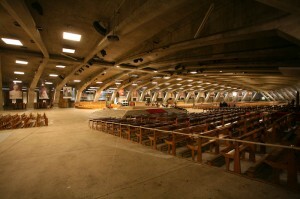 This is a place that you need to visit at different times of the year to get the full effect of the changing seasons. 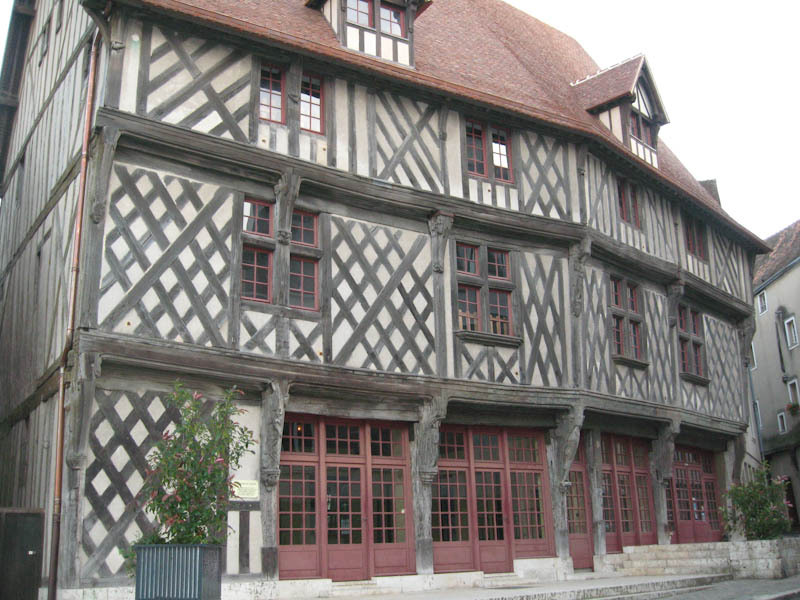 There are no Aires near Giverney and in October all the campsites are closed so we headed north of Rouen to Cleres, a place we had used last year – a good stopover and a couple of hours from the ferry port of Calais. Cleres village is very quiet village and on both visits we have found nothing open. The next morning we drove to Gravelines and booked Chase into the Vet ready for our return home. We spent the night on the quay at Gravelines, a favourite spot for Brits returning home. After Chase had had his passport stamped we moved over to Cap Blanc Nez and spent the afternnon walking around and soaking up the last remnants of sun before driving back to Calais to spend the night in the P&O carpark in readiness for our early morning crossing back to Dover and home. Overall a great holiday, we travelled further than we intended and did more one night stops than intended. The weather in genral was good and warm but we had too many strong winds while on the Med coast and surrounding area. It turned cold when we moved to northern France but then it was October.